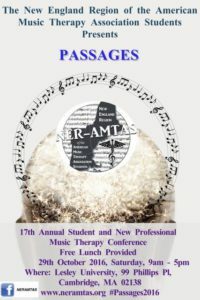 On behalf of the New England Region American Music Therapy Association Students (NER-AMTAS), we humbly welcome you to join us at PASSAGES – our 17th Annual Student and New Professional Music Therapy Conference, held on the 29th of October at Lesley University from 9am-5pm. Passages, is a free conference that features presentations by music therapy students from Anna Maria College, Berklee College of Music and Lesley University. This year, we welcome all other student professionals, specifically, our medical colleagues from neighboring schools. We believe that this advocacy can inform our colleagues on how we can work with each other to serve our clients in the near future. We hope you will support and join us at this event. See you there! Thank you! Please find below, links you may find useful. Do drop me a message if you have any questions, Thank you! Submissions for Passages 2013 are now being accepted. The Passages Student and New Professional Music Therapy Conference is a free one day conference sponsored by the New England Region of the American Music Therapy Association. Fall 2013 will mark this conference’s 14th year in existence. Passages regularly features presentations by student music therapists as well as music therapists in their first few years of practice. Presentations throughout the day focus on topics such as the use of music therapy within specific community settings, the application of specific music therapy techniques and interventions, as well as case studies focusing on results of treatment on specific diagnoses and populations.